I wonder how long the planning and logistics of the whole operation and manufacturing of the prefab components took? They don't appear to be encasing their custom steel columns in concrete so it would be interesting to compare the durability and ability to withstand forces of this building to a similar one made with rebar and concrete. Its all about shifting the design and coordination upstream, so site activities are optimised, everything fits as planned, no surprises. Nothing revolutionary about prefab, this is just the logical conclusion of applying it to the whole building, as opposed to just the MEP or bathrooms as they do on some projects in the UK. The steel fabrication is clearly the key to the success of this process, and they are claiming it is earthquake resistant, so I guess it should be fairly robust. 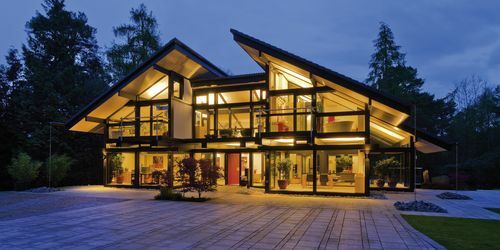 Huf Haus from Germany installs kit houses in the UK - also in a short time (fortnight). I think I saw it on BBC's Grand Designs by Kevin McLeod a few years back. four weeks. Four weeks to build something rather lovely. I have coveted one ever since watching that very show. I'd love to build and live in one, gorgeous houses, but you need the right location. Big Huf Haus fan but have you seen how effing expensive they are? I'm never going to have one. I hate that. Wouldn't a Huf Haus be cheaper than a traditional built house of similar square footage and design as the former is all prefab? There are companies in Norway offering similar designs of prefab timer houses for half the price. You can have one shipped to the UK for less than 100K. Up to the same standard as their 2.1% value lager?